When Mexico City quadrupled in size from 1940 to 1970, the city experienced unending gridlock—something any Bengalurean can relate to. Today, Mexicans still battle long commute times, but the government has ameliorated its transit-induced headache after implementing large-scale changes to its public transit. Meanwhile, Bengaluru’s commuters continue to sit in hours of traffic amid a sea of angry honkers. Migrants continue to flow in, and the vehicle population continues to grow. 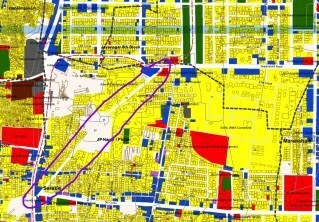 Although Mexico City has more than 220 km of rail in place, dissimilar to Bengaluru’s still infantile Namma Metro’s 31 km, the key to Mexico City’s progress has been the Bus Rapid Transit (BRT) system and its affiliated segregated bus lanes, according to Adriana Lobo, World Resources Institute (WRI) Mexico Director. During the WRI-hosted #UnlockBengaluru conference on July 9, Lobo presented a timeline of Mexico City’s transit growth, which she called a very “happy story.” While the city was growing into the 20 million plus mega-city it is today, it faced a transit emergency. It wasn’t until the 2005 arrival of the BRT, which today has six lines, 177 stations, and carries over 1 million passengers per day, that some of the traffic chaos began to subside. “Commuting in Mexico City really [hurt],” Lobo said. She explained Mexico City’s traffic problems weren’t due to a lack of buses, but a lack of quality of buses. Sixty-four percent of riders had said they didn’t think the buses were safe, let alone clean, efficient, or capable of seamless transfers. With the addition of BRT, 6.4 percent of commuters transitioned from private vehicles to public buses, reducing approximately 32 million kilometers of travel every year. Now, bus travelers are saving an average of half an hour a day because of the bus-only lanes. Prior to the BRT, Mexico City initiated a road space rationing policy. “Hoy No Circula,” or “Today [your car] does not circulate,” began in 1989 in attempt to improve traffic, but more importantly, air quality. The 2016 mid-year World Health Organization pollution index ranked Mexico City 17th, four spots after Delhi. In 1992, the United Nations reported Mexico City was the most polluted city in the world. The Hoy No Circula program prevents vehicles from being in circulation on a certain day of the week depending on the last digit on their license plate. It also requires vehicles in Mexico City get emission tests every six months. Drivers are then given a sticker that represents how many times their car needs to skip circulation per week. Older cars, which cause more air pollution, must skip circulation twice per week, newer cars are only required to do so once. When contamination levels peak, as they did earlier this year, the government asks all vehicles to skip circulation twice per week. A study from the University of Michigan claimed there is no evidence Hoy No Circula has improved air quality. Lucas Davis, who penned the study, said the policy ironically led to an increased number of registered vehicles in the city because citizens were choosing to circumvent the law rather than follow it. Media have reported Hoy No Circula is not as of effective as public transit at combatting pollution and congestion. Especially because it is widely known that drivers of older cars often bribe emission testers into giving them a sticker that allows them to circulate more often. Again, circumventing the policy. Despite this, Mexico City has preserved Hoy No Circula. In 2016, after Delhi maintained its spot as one of the world’s most polluted cities, the city of 18 million tried out the even-odd strategy. Also known as the alternate-day travel scheme, vehicles with plates ending in even and odd numbers alternate days on the road. Even numbers are allowed on even dates, odd numbers on odd dates. It was met with a mix of praise and criticism, with many frustrated that women and two-wheelers were exempted from the restrictions. Delhiites have access to one of the largest metro rail systems in the world, still many claimed the city didn’t have the proper public transportation infrastructure to impose such a policy on the population. According to The Economic Times, the Delhi Metro Rail carries approximately 2 million people a day, 25 percent of Delhi’s commuters. Forty-two percent of Delhiites use the city’s bus system, 25 percent commute via private vehicles, and the remaining eight percent use autos. There have been talks of implementing the even-odd policy in Bengaluru, but imitating Mexico City’s Hoy No Circula, or adopting any kind of road space rationing policy here may be more difficult than it sounds. Mexico has three times as many police per every 100,000 people than India and Mexico City’s traffic police force has a fleet of 30,000, while Bengaluru has less than 3,000 traffic police officers. A lack of traffic police presence makes any road-based policy impossible to enforce. In Bengaluru today, there is one car for every two people. The Bengaluru Metropolitan Transport Corporation’s (BMTC) 6,300 plus bus fleet carries 5 million Bengalureans per day—more than half of the city’s commuters—to 53 stations. The remaining majority rely on private cars and two wheelers. Statistics show, and many of Saturday’s conference-goers agreed, Bengaluru runs on its buses. The Urban Bus Toolkit compiled by the Public-Private Infrastructure Advisory Facility (PPIAF), a World Bank project, says there should be anywhere from 0.5 to 1.2 buses per 1,000 people depending on the presence of other transit options. Because Bengaluru doesn’t yet have a widespread rail system, buses remain the best option for mass public transit. That means there should be at minimum one bus for every 1,000 people. BMTC’s current fleet of 6,000 buses is at least 4,000 buses short of the number needed to adequately serve the population. Some say that estimate is much too low, suggesting that Bengaluru acquire as many as 15,000 buses right now. That aside, there remains the issue of existing buses not being able to move. “Take the busses out of congestion now, or you’ll regret it forever,” Toni Lindau said, WRI Brazil Sustainable Cities Director. Mexico City was the world’s most polluted city in 1992, according to the United Nations. Pic: Youtube,auriferousclovers. Segregated bus lanes, an integral part of the BRT system, require construction and funding, but if implemented, allow for the kind of shortened commute times Mexico City now boasts. BMTC has been planning a pilot bus-only lane on Old Airport Road toward Whitefield road for six months, but they have yet to install it. As successful as segregated bus lanes can be, if underutilized, i.e. if bus frequency is too low, they can aggravate drivers who will have a lost a lane to make room for the bus lanes. Should public transit be subsidised? Unfortunately, BRT and segregated bus lanes, whether implemented or not, may not change the steep prices that have come to characterize BMTC and which have continued to rise over the years. BMTC ticket prices range from Rs. 5 to Rs. 44. In Chennai, for example, bus prices max out at Rs.14 for their non-AC buses. BMTC’s Managing Director Dr Ekroop Caur said she has no interest in BMTC profiting off commuters, the price hikes are simply the only way for BMTC to sustain itself. A common argument for subsidising transit is that it’s the most equitable way to provide transport; it ensures equal access to all citizens. Studies have shown subsidising transit also leads to increased ridership, which in turn leads to increased frequency of the entire system. This can decrease congestion and pollution. But what seems like an easy solution requires breaking through a lot of bureaucratic red tape, as well as the restructuring of the current public transit infrastructure. Many public transit activists have been campaigning years for subsidised transit, or at least cheaper fares, but have watched prices continue to rise. According to Pawan Mulukutla, WRI India’s Manager of Urban Transport, growth trends suggest there will be as many as 15 million trips a day in Bengaluru by 2025. “We are talking about a Monster building up,” he said, emphasizing that the city needs a holistic approach to solving these problems. If half of Bengaluru’s population relies on the city’s bus network, mimicking Mexico City’s BRT system could be the best step toward a mobile Bengaluru. But much like subsidizing transit, building an entirely new system would require a massive upgrade and upwards of 200 crore. Pavement Perorations – Part 4: A moment of epiphany!